The magician turns a lamp on. Next he takes a pitcher or glass of milk and makes it vanish (via a Magic Milk Pitcher or other similar apparatus). The moment the milk vanishes, the lamp goes out. The magician removes the lamp shade, unscrews the bulb, and pours out the vanished milk! Don't like working with liquid? This classic trick can be done with salt, a silk hank, confetti, small candies and so forth. Most importantly, a wireless remote control puts the magician is in full control of the lamp going out. 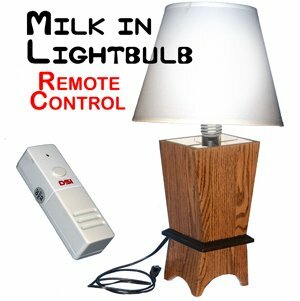 This is a professional prop, strong in effect, and comes complete with lamp, light bulb, remote and instructions. Magic Milk Pitcher not included. Note that vase design sometimes varies.